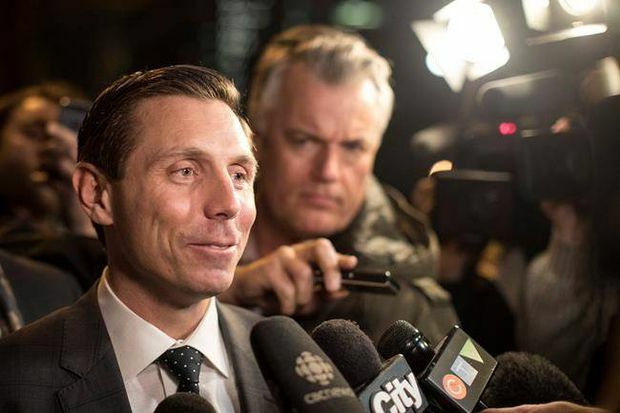 Patrick Brown is expected to avoid a formal reprimand for breaking Ontario’s ethics rules, as neither the Liberals nor the Progressive Conservatives intend to call for a debate in the legislature into the former Tory leader’s financial affairs. Integrity Commissioner J. David Wake has recommended that Mr. Brown be reprimanded on the floor of the legislature for failing to disclose a $375,000 loan from a close friend who later went on to become a Tory candidate. His report marked only the second time the watchdog’s office has proposed such a penalty for an MPP. When asked if Doug Ford, Mr. Brown’s successor as leader, plans to call for a debate, a spokesman would say only that, “We are focused on the future and getting our province back on track for the people of Ontario.” A spokesman for the Liberal House Leader’s office said it is up to Tory MPP Randy Hillier, who made the complaint that launched Justice Wake’s investigation, to table a formal motion to debate his report in the legislature. Mr. Hillier said that as a backbench opposition member, he has no authority to ask the legislature to address the matter and accused the government of reneging on its obligations. “This will do a significant disservice to the House,” said Mr. Hillier, whose complaint cited, among other things, a Globe and Mail report on a proposed $375,000 deal between Mr. Brown and Jass Johal, the close friend. The process of “professionalizing” Mr. Brown’s finances was never completed as he resigned as leader in January, the report says. Mr. Brown was forced to step down over allegations of sexual misconduct, which he has denied. He was also ejected from the Tory caucus and now sits as an independent member. The writ drops on Wednesday for the June 7 provincial election, leaving no time to address the report in the current legislative session. In 2006, after three days of debate, the legislature reprimanded then-Liberal cabinet minister Harinder Takhar after a former Integrity Commissioner found he had violated ethics rules. In the case of Mr. Brown, Justice Wake found that he avoided scrutiny over his down payment by concealing the true source of funds when he applied for a mortgage, saying he was “less than transparent” with Toronto-Dominion Bank. His report revealed that Mr. Brown obtained a $1.72-million mortgage to buy a $2.3-million house near Barrie in the summer of 2016, after approaching James Dodds, a TD vice-president and his long-time friend. Mr. Dodds referred questions to TD spokeswoman Julie Bellissimo, who declined to say whether the bank is reviewing the loan. “For privacy and confidentiality reasons, we do not discuss any of our customer relationships, transactions and accounts,” she said in an e-mail. Mr. Brown did not tell TD he had received a $375,000 loan for the bulk of his down payment from Mr. Johal, a Brampton paralegal. Instead, he provided his mortgage specialist with an affidavit from Mr. Johal, saying he had bought the politician’s stake in a restaurant and some Aeroplan points for $375,000. However, Mr. Brown had cancelled the asset sale five weeks earlier, the report found. Providing misleading information in a mortgage application is a serious matter, experts say. If lenders discover they were misled after a sale closes, they have the right to “call in” the loan, meaning it would be immediately payable. Mortgage specialists and lenders scrutinize the source of borrowers’ down payments because of anti-money laundering laws. In the case of asset sales, they often require a paper trail, including documents from lawyers and cancelled cheques. “We have to verify each and every source of every penny of down payment,” said Joe Sammut, a broker at Toronto-based Mortgage Architects. Carlos Naldinho, a PC Party member, has lodged a formal complaint with the Financial Transactions and Reports Analysis Centre of Canada (FINTRAC). “I would like them to find out where this money actually came from,” said Mr. Naldinho, founder of a protest movement in response to several nomination races that ended in controversy under Mr. Brown’s leadership. Both large transactions exceeding $10,000 and any suspicious transactions must be reported to Canada’s financial intelligence agency, which monitors money laundering. A spokeswoman for FINTRAC declined to comment.